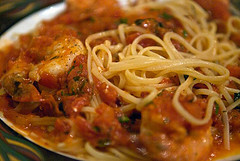 Shrimp Fra Diavolo is a delicious easy meal to prepare after a busy day at work. It's one of my favorite Italian cooking recipes because it is a great dinner for two. To compliment this spicy dish I suggest a glass of fruity red wine such as a red Zinfandel or Pinot Noir. Prepare pasta as directed on package. Add shrimp to the pasta water during last 3 minutes of cooking time and cook until opaque. Drain pasta and shrimp, return to saucepan. In a nonstick skillet, heat oil over medium high heat. Reduce heat to medium and add onion and cook until tender. Add garlic, crushed red pepper and white wine cooking about 30 seconds longer. Add tomatoes, tomato sauce and salt. Heat to boiling and cook until liquid is reduced to desired consistancy. Pour over pasta and shrimp, stir well. Put on serving dish and sprinkle with shredded cheese. Serve immediately. Time saver: While Tomato sauce is cooking to reduce liquid, make your salad and heat in the oven a loaf of crusty bread. You can substitute the shrimp with Scallops, lobster or crab meat. I have made this dish with a combination of shrimp and crab. Delicious! Crab needs to be cooked and shelled first, which I do the day before. Then just add the crab meat at the end of cooking the sauce. Heat from the sauce reheats the crab meat.